The year was 1929 and Bryant Park had yet to undergo the redesign that brought us the Lawn and grand, tree-lined allees for which it is now known. Elsewhere in the country, a game called "Beano" was taking hold. Players eagerly arranged dried beans on sheets of cardboard as numbers were called. If that practice sounds familiar, it's because that game went on to evolve into the game we call Bingo. 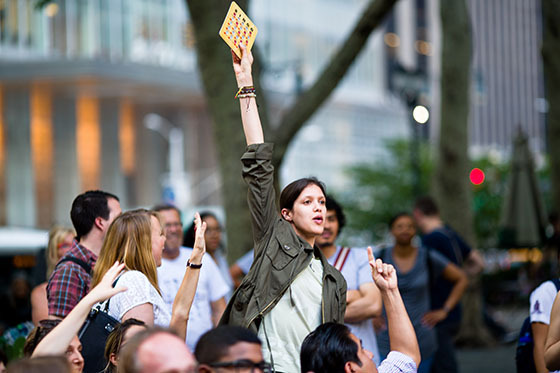 We love to honor tradition here at Bryant Park so we're excited to announce the return of Bingo to the Fountain Terrace. While there won't be any dried beans at this event, we will have Comedian Andy Ross calling numbers alongside music by DJ Flip Bundlez. It's free to play and we'll be giving out prizes with every win. Join us for the first three Thursdays in June, from 7pm to 8:30pm on the Fountain Terrace as we celebrate one of America's favorite games. Pre-registration is suggested. Due to the expected popularity of this program, it is strongly recommend that players pre-register online beforehand.